JOHN SCULLY: "I WOULD LOVE FOR CHAD TO FIGHT BERNARD...EITHER BERNARD OR PASCAL"
"One of the biggest things with Chad is his jab. He's always gotta utilize a superior jab. When you look at his size and his intangibles, his jab should be superior to anyone's. If you take the best of his jab and the best of anyone else's jab at that weight, I just can't see anyone else out-jabbing Chad Dawson, so that was my main thing. As far as Bernard in particular, I just felt like Chad needed to step up his output a little bit more...I would love for Chad to fight Bernard again...I would like either Bernard or Pascal. I don't see anybody else before those two. It's like the Pacquiao and Mayweather situation. You know the logical next opponent for both of those guys should be each other and it's like that in this situation. Other than Pascal or Bernard, I can't see any other fight that makes sense just considering the circumstances and the history with those guys. I would assume that that's going to be next and that it will draw attention and give Chad motivation," stated world-class trainer John Scully, who talked about the future plans of former light heavyweight champion Chad Dawson after the controversial ending to his fight with Bernard Hopkins. Check it out! PC: Before we get into the fight against Bernard Hopkins, who called you with the proposal to train Chad Dawson? JS: What happened was in early July, a friend of mine called me and wanted me to get a hold of Chad for something totally different. It was business related; he wanted to do some kind of endorsement thing, so I called Chad to put him in touch with this guy and he goes, "Man, it's crazy that you happened to call me today because me and my brother was talking about you this morning." I figured he was talking about the old days when we used to go on the amateur trips and stuff, but he said, "Nah, I was thinking of making a change in my camp and I was talking to my brother about having you train me. Would you be interested in the job?" Of course I took it and we started working out a couple of days later, so it was kinda crazy that I hadn't talked to him in months and months and the one day I try to get a hold of him, he was planning on calling me the same day. PC: You have history with Chad. My man Ron Frazier actually thought you were a better trainer for Chad than Manny Steward because you knew him so well. Give us your history with Chad my man. JS: I've known Chad since he was 11 years old. I worked his corner at times when his amateur coach wasn't there when he was 14. I even picked him up with some of my kids that I train and he was friends with. I remember I went to Brooklyn one time to meet with Dmitriy Salita and I picked Chad up on the way. He was 16 then. I go way back with him. And the thing is, with Emanuel and any trainer, you can talk about Floyd Mayweather or anybody, just because a guy is well-known, it doesn't mean that he is the best fit for every single fighter in the world. I mean, that's not a knock on any trainer. I think, from what I gathered from Chad and the people in his camp, his brother, his father and his strength coach, out of all of the trainers that he has worked with, they seemed to think that I mixed the best with him. 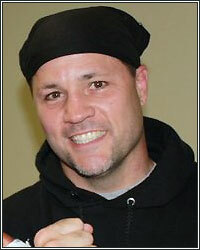 Some people will actually say, "That's crazy, Emanuel is a big-time trainer," but you take Jack Loew and Kelly Pavlik. Up until Kelly beat Jermain, who was Jack Loew? A lot of people had never even heard of Jack Loew. I had never even heard of him, but he trained Kelly to beat Jermain twice, and once by knockout, so having a big name isn't necessarily the end all be all of being a good trainer. Chad and I, for what it's worth, we go way back and he seems to trust me. Since he was a kid, I've always took care of him. I have never steered him wrong; I have never told him false things and that's the way the cards fell. PC: It was a tough spot for you to be in because it wasn't a tune-up, it was a world title fight against a legend of the sport. When you came in, what were some of the things you wanted to get Chad to do that you felt he had either gotten away from doing or never really utilized very well? JS: One of the biggest things with Chad is his jab. He's always gotta utilize a superior jab. When you look at his size and his intangibles, his jab should be superior to anyone's. If you take the best of his jab and the best of anyone else's jab at that weight, I just can't see anyone else out-jabbing Chad Dawson, so that was my main thing. As far as Bernard in particular, I just felt like Chad needed to step up his output a little bit more. When you watch Chad Dawson fight, even just a regular fight, like the Adrian Diaconu fight, it wasn't like an amazing scenario fight or anything, but there were moments when Chad let his hands go where you can say, "Wow, Chad can really fight when he lets his hands go." It's very pretty when he lets his hands go. My job was to bring that out of him on a more consistent basis, and that's the way it will be from now on. Chad will reach his full potential every time out. PC: When Hopkins went to the canvas, what was your thought process? What were you thinking? JS: To be completely honest, as soon as he went down, I looked at the cutman and I said to Rafael Garcia, "The fight's over," and he said, "What do you mean?" I told him, "He's not going to get up." I was very upset and irritated just because of all of that hard work we put in, and I'm sure Bernard put in some hard work too, but knowing him and his history, I just knew he was going to stay down. Now, whether he was hurt or not, I don't know. I'm no doctor, but as soon as he went down, I knew the fight was over. And I was very...I can't even put a finger on the actual word. PC: Naazim told me that he felt you guys would avoid a rematch and be content with the bragging rights from the way the first fight turned out. He feels as though whatever Hopkins does, you guys will be content with saying, "See he, couldn't do that to us." JS: Hey, look, I respect Naazim a great deal, but that's just a ridiculous thing to say. No one in their right mind is going to point to that victory. If we got the victory in that manner, I wouldn't point to that fight and say, "We beat that guy; we have nothing to prove." That's not even accurate and I'm surprised he would actually say that. I don't feel that way. I would love for Chad to fight Bernard again. PC: He only fought for about 5 minutes or so. Do you want him right back in there because of that or was it so mentally draining on him, you would like to see him take some time off? JS: No, I would like to see him get right back in. A lot of people said that they noticed he was more aggressive and was mentally stronger and more alive. He felt that way and he told me weeks before the fight that it was the best he had ever felt. People in his camp that have been there all along, his brother and his strength coach mentioned it to me as well. Gary Shaw mentioned it to me when he came up to camp in the Poconos. He was very excited and said it was a different kid that he was used to seeing weeks before the fight. I would think Chad is excited about that, you know, the way he's been feeling and the things that he has been doing in the gym different than he has in the past. I'd love to see him not get away from that. I want to see him jump right back in and pick up where he left off. He was really peaking and I think mentally, he is in a new position and a new place and there is no sense in letting that go to waste. PC: If not Hopkins, what caliber of opponent would you like to see him fight next? JS: From my own thinking, I would like either Bernard or Pascal. I don't see anybody else before those two. It's like the Pacquiao and Mayweather situation. You know the logical next opponent for both of those guys should be each other and it's like that in this situation. Other than Pascal or Bernard, I can't see any other fight that makes sense just considering the circumstances and the history with those guys. I would assume that that's going to be next and that it will draw attention and give Chad motivation. PC: You mentioned to me in some emails that you go back a long ways with Naazim, and in both of you guys defending your fighters, you had hoped for that relationship not to get ruined. Have you spoke to Naazim since the fight? JS: No, I haven't. It's kind of a funny thing. I would like to talk to him because...a lot of times, when guys are fighting in the pre-fight build up and tensions rise and a lot of story lines are put out there....like I said, I knew Naazim way before everybody else did. People in the last few years have been touting Naazim, but I knew Naazim since '94, so I always knew he was a good coach. At the press conference, I had mentioned that I had been to his house and I know this guy really well and I picked up his kids from his house and brought them to the movies. Somebody told me that he said that wasn't true. I don't know if he was trying to downplay our relationship or what, but I most certainly have been to his house. There is no doubt about that in the world. I picked up his sons, Rock, Tiger, and his nephew Dynamite. I brought them to the movies that night. There is no question that I have been to the man's house. I don't know why he said I wasn't. It was a long time ago, so maybe he just forgot, but we go back to the amateurs. I have been to amateur tournaments and I have had kids box his kids. We have been in the opposite corners several times. We always see each other and it has always been great. I'm in touch with his son Tiger to this day. I talked to him a couple of days before the fight about other things. I don't want boxing to come between those types of relationships.